Be prepared for virtually any radiation contamination scenario. 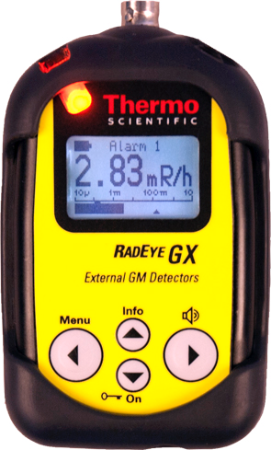 The Thermo Scientific™ Radeye™ X Series Survey Meters comprise three different types of compact, multi-purpose survey meters suited for a wide range of applications where personnel risk radiation exposure, whether they are emergency responders, fire fighters, nuclear power plant employees, or medical professionals. RadEye X Series Survey Meters can operate with virtually any manufacturer's Geiger-Mueller, scintillation or proportional detectors to perform general count rate, surface contamination and dose rate measurements. Measured quantities (requires individual probe calibration): Surface contamination (Bq, dps, dpm, Bq/cm2), Dose rate (R/h, Sv/h, rem/h), Count rate (cps, cpm). Operates with with dual phosphor α/β, NaI(Tl) and plastic probes. Measurement range default (overrange indication starts at):100,000 cps. Measured quantities (requires individual probe calibration): Count rate (cps, cpm), Surface contamination (Bq, dps, dpm, Bq/cm2), Dose rate (R/h, Sv/h, rem/h). High Voltage range: 100 V ... 1400 V.
Thresholds: 4 (30 to 1280mV, 1mV resolution). Energy windows: 2 ROI (region of interest). Operates with proportional detectors such as He-3 and BF3 neutron detectors. Measurement range default (overrange indication starts at): 100,000 cps. Measured quantities (requires individual probe calibration): Count rate (cps, cpm), Surface contamination (Bq, dps, dpm, Bq/cm2), Dose rate (R/h, Sv/h, rem/h), Count rate (cps, cpm), Surface contamination (Bq, dps, dpm, Bq/cm2). Dose rate (R/h, Sv/h, rem/h). High Voltage range: 100 V ... 2300 V.
Thresholds: 3 (30 to 1220mV, 1mV resolution). Energy windows: 1 ROI (region of interest). Battery powered (2 x AAA alkaline or rechargeable), powered desktop station available as option. Alarms 80 dB at distance of 30cm (11.8 in.). Communication interface: Infrared (IR), optional IR to USB cable or IR to serial cable, optional Bluetooth™. Settings and data analysis done by optional Windows™ based PC-software via serial data connection, USB or Bluetooth. Logs last 250 alarms, error messages and changes of configuration. Background subtraction: in count rate and contamination mode. Probe library for 16 different detectors with data like high voltage, calibration factor, dead time correction, overload threshold, detector area and timeout for detector failure; Default values for common probes are preset. Internal memory: The last 1500 measured values are saved and can be read out via PC program; Max and mean value of count rate and dose rate; Time interval is factory preset to 120s by default; Scaler measurements and momentaneous readings stored manually. Averaging filters: Ratemeter filter type - Advanced Digital Filter (ADF), Digital RC-Filter with time constant, 1s to 180s, depending on count rate and count rate change. Certifications/Compliance EMC: Disturbance emission - EN 61000-6-3, immunity - EN 61000-6-2.